We’ve been experiencing a heatwave in Vancouver (okay East-Coasters, I know this is relative 😉 over the past few weeks, and sleeveless silk blouses have been my best friend. These perfectly breezy pieces are not only comfortable, but they’re polished enough to pull a look together and to wear to work as well. I’ve been living in this particular top – which reminds me a little of men’s striped pajamas – lately… and I love that it’s so soft that I’m tempted to sleep in it, too. Have a great Monday! It’s been really hot here in NY too – I love this outfit…it’s simple but still polished & chic! Such a fun and fresh summery look! Love the shorts, they have a great vintage feel to them! I love the complimenting colors orange & blue. We’ve been having very hot and humid days in NY so I’ve been going to my sleeveless silk tops as well. I love how you have added a pop of orange to this outfit. Blue and orange works so well together. I absolutely love your orange clutch! It contrasts your outfit nicely and overall give a wonderful (heatwave, I mean summery) look! I like how the stripes in the top go in different directions; reminds me of my Anthropologie dress’s stripes. Looks like a perfect summer outfit! Send us some of that heat! Your outfit looks fresh and summery. I love that orange clutch too! NY has also been extremely humid and muggy. This outfit would definitely do the trick of keeping you cool yet fashionable. I love how all the pieces are so versatile and can be style in numerous way. LOVE !! 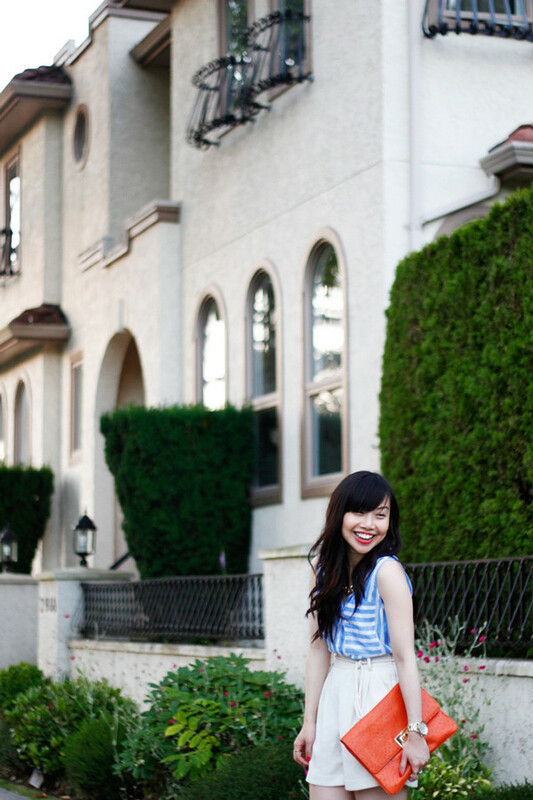 Love how sophisticated this look is, and the blue stripes are so crisp and fresh. You’ve reminded me that I really need to pop into Club Monaco more often! The MK clutch is everything. I love how the Club Monaco blouse looks against your skin.